As a change of pace, I thought I’d post some code that doesn’t go out of its way to be bad. JAMultiTypeSavePanelController is a class (abstracted from ImageIO Export for Acorn) to handle the case where you want to offer the user a choice of formats to save in. 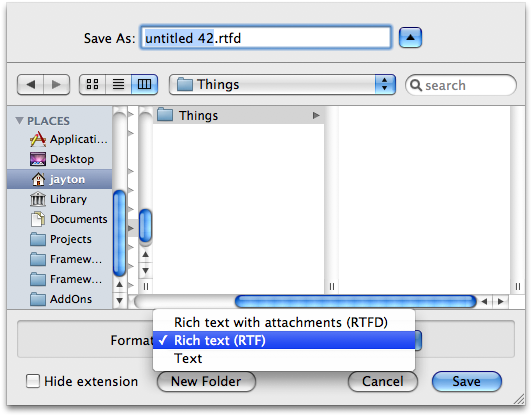 controller.autoSaveSelectedUTIKey = @"document format"; // Optional: preferences key for selected type. controller.sortTypesByName = NO; // Optional: show in specified order instead of alphabetically by display name.